G’day TAY. I like to watch Jim Sterling on Youtube. The guy has a lot great points once you understand what his persona is all about. I also like Extra HIstory, an offshoot of Extra Credits. Extra Credits have made a video where they basically argue that €60,- isn’t the right price for a video game anymore. Jim Sterling has of course made numerous videos detailing why he thinks that’s a moot question. I’d like to share my take on it because I think it’s worth mentioning, and I hope it helps other in their own opinions. First off, this debate started because companies have come under fire for micro-transactions, stating that making 60.- on a game doesn’t cover production and maintenance costs, but setting the price higher basically let’s customers pass on it. Ergo, micro transactions are the way to bridge the difference and turn a profit (or season-passes, regular DLC or other you name it). People defending the micro transactions will fly the banner of “having the option”, but that doesn’t really fly does it? If everybody has the option of not purchasing, then how are the companies getting the money? A sold game is one thing, but are they really betting their expense coverage on people “choosing” yes? Of course not, previous experience, market intelligence and the sort shows an average of player spending on micro-transactions. The whales making up for all those not spending the money. So basically, going with this train of thought means that ‘whales” (those that spend inordinate amounts of money on microtransactions) are covering the costs of production. The rest of the buyers just provide the base-line of income or something. Hold that thought for a while: whales covering the costs of production. Ladies and gentleman, let’s take a step back, put on a nice suit, and play manager for now. We work for a video-game publisher. Not a developer. So a developer walks in, says I have the greatest video-game idea ever. He shows a demo and it looks great. Now consider the relation between a developer and a publisher. Developer has a game idea but needs funding, Publisher has funds, and is willing to to provide the funds with the idea of making a profit when actually launching. So in those talks between you the publisher and this developer, the developer basically comes to loan money, and ask for the marketing machine of said publisher. So as a publisher, you see the demo, and you think, can I sell this? You ask what amount the developer needs. Which can be any amount. You make a projection on how many units you sell (you have models, industry intelligence and experience for it) and you come to the conclusion that you need to sell a number of unit’s at a certain amount to break even. So basically, as a publisher, you loan an amount of money, then sell games that make that money back. Let’s get some imaginary numbers in here. So the developer asks for €60.000,- that means you need to sell 1.000 units to break even. All right you say, I think I can sell 1.000 units, let’s do that. But how do you really know you can sell that many units. While you can speculate and prognose, models and you name it. You don’t really know for sure, not only because the market can be fickle, but also because the developer can fudge it up, or because the developer might not finish his game with the amount and come back for more. So basically there’s a risk involved. And as a financial person, you try to reduce, mitigate or reduce risk. So what to do? 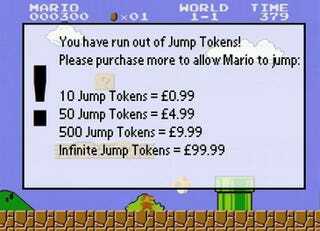 Well then, here’s where micro transactions do come into play. Selling something to an unknown person is a challenge. Selling something to someone you can track or know about, or someone you can engage with like a door-to-door salesman is is easier. So micro-transactions are a different way of selling, and it reduces the risk you take. (which is why pure publishers like EA and Activision are way more likely to choose this route then publisher-developer hybrids like Nintendo or Sega). Now at face value, this seems reasonable, and even commendable. A risk reducing tactic like this makes it easier for a publisher to say yes. So everyone wins right? You don’t have to buy the micro-transactions, and their main purpose is to secure the funding before making the actual money according to my theory, but I asked you to hold onto that thought of ‘whales’ for a reason. You see, the application of micro transactions in video games isn’t the end of the story. I mentioned direct engagement and door-to-door salesman tactics. Publishers demand micro-transactions in games not based on a gameplay ideal (that’s a developers job, not a publisher) but based on business sense. And businesses aren’t people, so ethics are only applicable where it doesn’t mess with their bottom line. Since micro-transactions carry similarities to gambling, but aren’t technically gambling, the rules and regulations around gambling don’t apply, meaning publishers can use gambling tactics in order to entice those sensitive to gambling addictions in order to make whales out of them. With micro-transactions, people with addictions or addiction tendencies are being exploited. Micro-transactions are a choice for a lot of people much like throwing a coin in a slot-machine is. To others, it’s not a choice’ it’s a compulsive need, like smoking or excessive drinking. They need help. Worse, young people who don’t have a gambling addiction might develop an addiction because of it. Jim Sterling made several video’s on the subject, MatPat made two game theory video’s that detail these gambling tactics. But at the end of the day, it’s legally not gambling, and it enforces funding for a number of projects. The question is: do we really want to get games at the costs of actual human lives, people who will rack up debts so morbid that they end up in crime? Or end up homeless? I know it’s not a gigantic number of people, maybe it’s just a measly 100 (I bet it’s way more, but roll with me), do you defend business practices on services that make your gun purple while 100 people will get destroyed due to their involuntary compulsive behavior? So on a personal level. Destiny could have been a game with no shaders and the like, maybe with a character or weapon type less then it launched with in order to decrease the costs. The publisher would have a higher risk, but it’s just the risk as we stated. after all. Now one last thing: my argument is based on the idea that micro-transactions are a risk-reducing element to the funding, not an actual element in covering costs. But some of you might have some more market insights, and now from research that say 00.1 percent of gamers spend over 10,- on micro-transactions. You can put that into the equation for the break-even point right? Well, in that case, I’d say the company increasing their risk, as outside of reaching a certain number of sales (which have to be met in this case), they also take the risk of that percentage coming to fruition in their game. Remember, it’s about risk reduction. Speculating is gambling, but I don’t see publishers actually gambling and increasing their risks anytime soon. So basically, any amount is a good amount for video games. €60 is fine. It’s about managing development in order to make sure your production costs stay under the threshold calculated by speculation on sales-numbers. Don’t think you can sell enough? Don’t do it! Want to have a really cool extra feature? Then check if it’s manageable within the budget, and if not, don’t. And remember, Flame shields up, keep your temper, this comment section might just heat up.